Esker Celtic beat Knocklyon Utd. 16 SunA1 (KO 1pm unless stated). Esker Celtic draw with Clontarf FC. 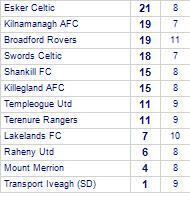 Esker Celtic lose to Kilnamanagh AFC. 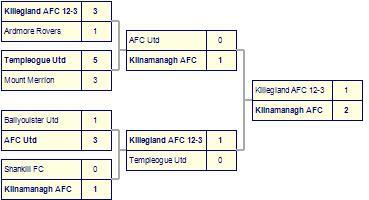 Kilnamanagh AFC has yet to be beaten in this competition, having won every game. 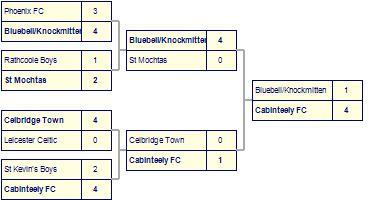 Castleknock Celtic take spoils against Esker Celtic. 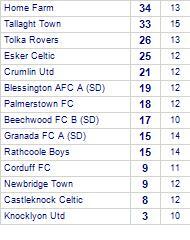 Esker Celtic has yet to win in this competition, having lost its last 3 games. 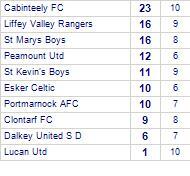 Esker Celtic take spoils against Dalkey Utd (SD). 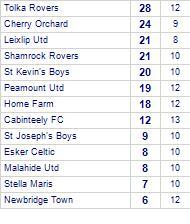 Esker Celtic share honours with Malahide Utd. Malahide Utd has yet to win in this competition. 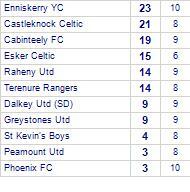 Esker Celtic despatch Manortown Utd. 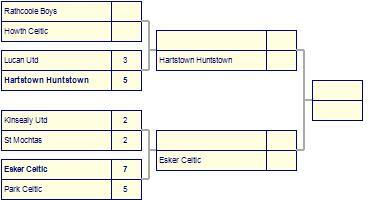 Esker Celtic has yet to be beaten in this competition, having won 3 out of its last 4 games. Esker Celtic claim victory against Howth Celtic. 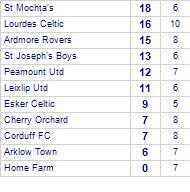 Howth Celtic are currently on a losing streak of 6 games. Esker Celtic take spoils against Arklow Town. 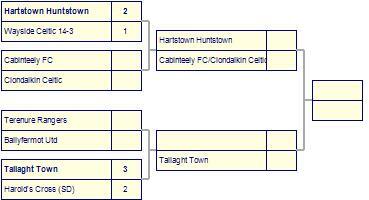 Arklow Town has yet to win in this competition, having lost all 5 games. Home Farm beat Esker Celtic. Home Farm are currently on a winning streak of 4 games.They have won 3 out of 4 home games. Esker Celtic despatch Wayside Celtic. 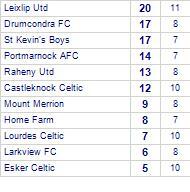 Esker Celtic take spoils against Mount Merrion. 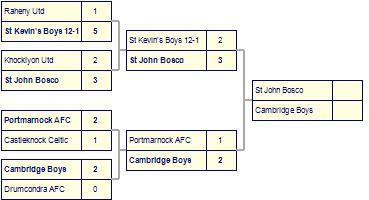 Esker Celtic despatch Cambridge Boys. 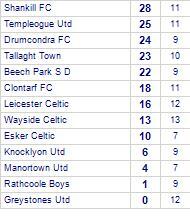 Esker Celtic beaten by Templeogue Utd. 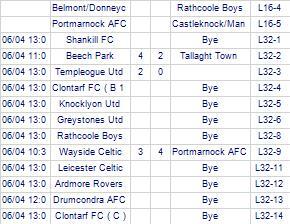 Esker Celtic despatched by Portmarnock AFC. Corduff FC beaten by Esker Celtic. Esker Celtic take spoils against Terenure Rangers. Ardmore Rovers beat Esker Celtic. 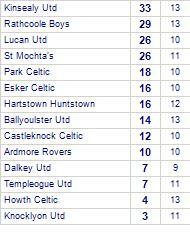 Howth Celtic despatched by Esker Celtic. Esker Celtic claim victory against Templeogue Utd. 15 Sun 1 (KO 11am unless stated). Youths Sun 3 (KO 11am unless stated).